Charles and David Koch are brothers and oil billionaires who have a long history of political interference and climate misinformation. Their multifarious support for fossil fuels has helped to slow America’s adoption of renewable energy. They have also undermined efforts to pass climate and energy legislation at both the state and national levels. They have even managed to influence the Supreme Court and help sour American attitudes on the veracity of global warming. 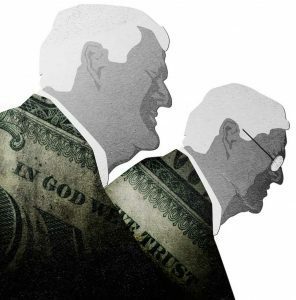 An investigative report on the 2012 GOP Presidential hopefuls revealed the extent of the Koch brothers sinister influence. The slate of 2016 candidates, like most Republicans running in the 2014 midterms, remain under the influence of these fossil fuel barons. The Kochs use their billions to support candidates who will carry out their fossil fuel agenda and deny any human role in global warming. The idea that the Kochs are instrumental to the Republican party is not just the view of liberals, this view was recently articulated by one of their own. A leaked audio tape of Sen. Mitch McConnell (R-KY) indicates that the Koch brothers have maintained and even reinforced their hold on the GOP. McConell’s comments were recorded at a top secret June 2014 Koch retreat. McConnell’s remarks demonstrate just how much power the Koch brothers continue to hold over the GOP. In his speech, McConnel lauded the Koch’s Supreme Court influence which facilitated the Citizens United decision. According to Oil Change International, the oil and gas industry received $10.5 billion in federal subsidies in 2013. If the Kochs had any integrity, they would return their share of the subsidies to the IRS. The Koch brothers’ influence extends all the way up into Canada. Koch industries has been heavily invested in Canada’s tar sands for more than 50 years. This involvement is multi-faceted and runs the gamut from extraction to refinement and transportation. The Kochs are active in Canadian politics. They aggressively lobby both the provincial and federal governments. They are also longtime contributors of those who support the fossil fuel industry. This includes the Fraser Institute, an influential policy shop closely allied with Prime Minister Stephen Harper and his fossil fuel obsessed policies. On issues like the minimum wage, the Koch brothers have managed to sway public attitudes and ensure that Republican legislators vote against any increases. This represents a major shift in American attitudes. While awareness of environmental issues has increased in most parts of the world, thanks to the Kochs and other sources of misinformation, Americans have actually grown more ignorant. In 2001, 42 percent indicated their concern for environmental issues, in 2014 only 31 percent indicated that they were concerned. The Koch brothers have invested tremendous sums of money to try to misinform Americans about a number of issues including the scientific veracity of climate change. Between 1997 and 2011, they donated more than $67 million to organizations with anti-climate agendas. Now many conservatives reflexively reject anthropogenic climate change without even considering the evidence. Through their front groups, they have repeatedly inflated the cost associated with acting on climate change, while ignoring the economic, environmental and health returns. Many conservatives believe that combating climate change would bankrupt our economies. As explained in a Grist article, the Koch brothers warrant our concern because they, “threaten to destroy American democracy…their extreme and self-interested positions are taking over the Republican Party.” They have amassed a fortune of more than $80 billion, and thanks to the Citizens United decision, they are free to spend massive amounts of money to influence electoral outcomes. Thanks in large part to Koch-backed organizations like the Americans for Prosperity (AFP), there is virtually no hope for climate and energy legislation in the foreseeable future.